The sunset in Abbotsford, WI, was beautiful. I went to bed thinking Tuesday would be a beautiful day, but I awoke to extreme rain, and to the news that there was more damage to the west and north. A friend sent me a photograph taken in the UP of Michigan near Houghton. Houghton, MI. 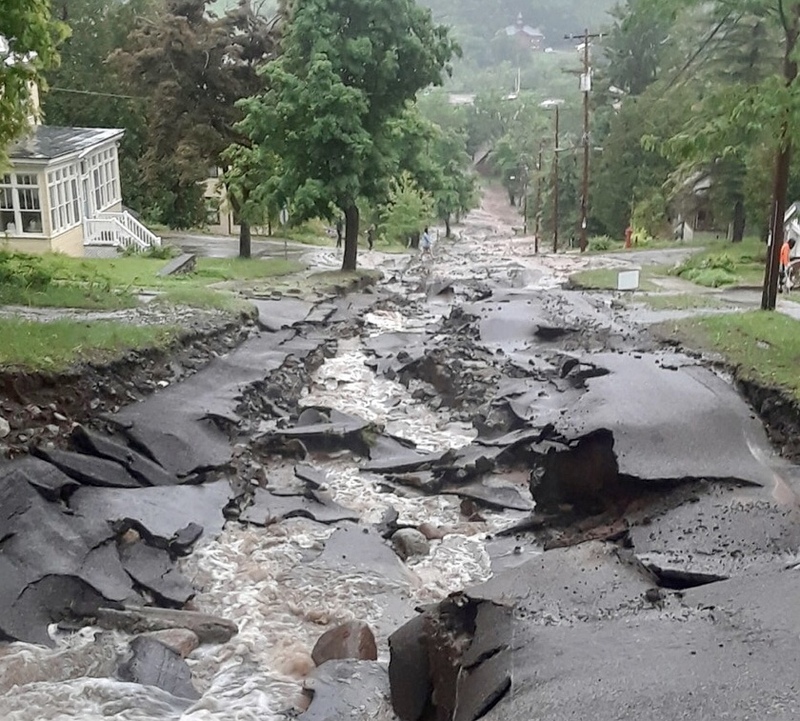 This is how extreme rain can ruin a road. I had my bike computer set to avoid major highways, so it put me on this gravel road heading west. Under dry conditions it wouldn't have been so bad, but the rain made it soft under the gravel and challenging to cycle on. But one does what one must, so I persevered for about 10 miles until I was able to create an alternative route on County X. That got me all the way to Chippewa Falls, a town to the northeast of Eau Claire. I made my way down to Eau Claire and found a Motel 6, where I am currently relaxing and watching rain out the window. Climate change and extreme weather aside, why are exes so complicated? En route from Abbotsford to Eau Claire, WI, fields are inundated. The rain had been more extreme than I had even realized during the night. 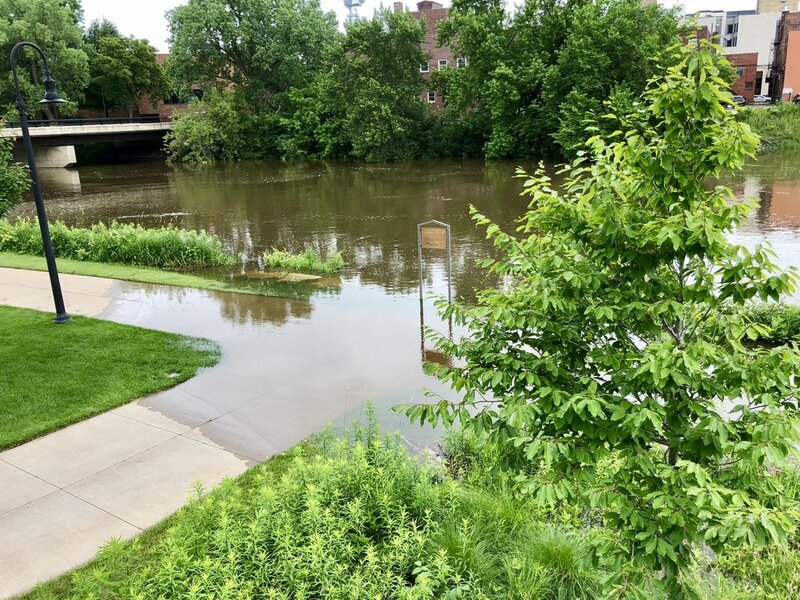 The problem was most apparent when I got to Chippewa Falls and turned onto a bike path on the Chippewa River. A sign said the bike path was closed, but I didn't know why. And then I noticed a family walking toward the closed path. I followed them, hoping the path was open, even though the sign said otherwise. And then I saw why the path was closed. I asked the father of this family why the water was so high. He answered, "I think it's because of the heavy rain last night." He went on to explain, "Last week the river was at normal levels. I really think this happened last night." It sure seems like a lot of water for one rainstorm. I tried another route to another section of the path. And I found this. The tunnel to the right at the bottom of the stairs is where the bike path is supposed to be. I stayed in the higher side of the bank and followed the river. And I came upon another section where paths were inaccessible. I found another route, although I never strayed far from the river. It's not easy to see in the picture above, but the bike path is again under water beyond the trees. I suspect the bank is at least 10 feet above its usual level. I wonder what tomorrow will bring? And how can we slow down extreme weather events? Take a look at https://citizensclimatelobby.org. I will be writing about their carbon pricing plan in future blog posts. There are genuine solutions out there; they may not be silver bullets, but by working together we can create market based economic incentives that will favor clean energy over energy that is pushing our climate toward ecological catastrophe. Let's do what is necessary.